I just recently finished up a couple of great weeks with Chris from North Carolina. Chris came out to learn birds and gameheads. I'm glad his taxidermy skills exceeded his karaoke skills, although "My Squirrel" is now stuck in my head everytime the song comes on! Chris, thanks for coming out my friend and thanks for choosing Artistic School of Taxidermy for your learning needs! I enjoyed instructing you in the art and I look forward to your return on lifesize. ​"I have got to say that Troy is one bad ombre when it comes to taxidermy. I had an amazing time at Artistic School of Taxidermy for 21 days. Not anything bad to say at all.....the food was freaking awesome and the hospitality even better. I learned ALOT while in idaho (even a little Kooskia culture) lol and also made a new life long friend. Thank you again for teaching me what you did and I am looking forward to coming back one day! If I could give any advice to anyone it would be to definitely give Artistic School of Taxidermy a shot, you will not be disappointed! Thanks again Troy." Bryce ventured South from Canada for 14 awesome days of training. Bryce put in some long hours and completed some great pieces! He did several whitetail deer heads and a few waterfowl. I know I've said this before, but I can't thank everyone enough for the great quality of students I have the pleasure of teaching. Bryce, you did a fantastic job! Hope to see you again soon my friend. Keep in touch! "​I drove 19h to go too Troy's school and let me tell you, that 19h drive was well worth it! I was there for 16 days and loved every minute of it. I learnt a ton of knowledgeable stuff that I will not forget because Troy made the time in the shop fun and interesting which made it easy to learn, the days felt like they were 2h when they were actually 10-12h. Troy is very patient with you, he will do everything he can to help you succeed, he's is also very honest and tells you when something needs fixing and will make you try to figure it out before he steps in to point it out. The view from his house was beautiful, coming from the prairies it was quite the sight to see for me. The food and sleeping acomadations were AWESOME, definitely will have to hit the gym when you return home lol I had a great experience down there and will definitely be going back in the near future!! ALSO FOR ANYONE GOING THERE FROM CANADA MAKE SURE YOU TELL THE BORDER GUARDS THAT YOU ARE GOING DOWN FOR A RECREATIONAL CLASS AND IT WILL BE A SHORT VISIT! " talented individual from Western Oregon. ​ for your learning needs! Well, once again, I had the pleasure of teaching another dedicated student in the art of taxidermy. Cameron, from Wyoming, came for 7 days to learn gameheads and birds. Cameron found out in a hurry that sewing is an integral part of taxidermy But with loose knots aside, he did an awesome job on all of his pieces and was a pleasure to teach. Safe travels home, and thanks again for choosing Artistic School of Taxidermy! I enjoyed instructing another great student! Keith traveled all the way from New Jersey to learn gameheads and turkeys. Folks, Keith was a total beginner and look at the pieces he turned out in 7 days! Keith, I had a great time teaching you the art! Hope to see you back, and thanks again for choosing Artistic School of Taxidermy! "I was fortunate enough to spend 7 intense days with Troy at the Artistic School of Taxidermy where I completed 2 gameheads and a turkey. There isn't much I can say that hasn't already been said in all the previous posts. I did a lot of research before committing to a school to learn taxidermy and I have zero regrets with my decision. In fact, I can't wait to get back there to further advance my studies. I am new to taxidermy and I'm glad I recorded a lot of video for reference as there is no way I could have remembered the tremendous amount of knowledge Troy shared. Troy shows you how to do each step then let's you proceed on your own and make your mistakes. One thing about Troy, there is no such thing as "good enough." If you do something and it's not correct (or could be better), he won't say, "good enough" and just move on to the next step. Instead, he'll have you redo it until you understand and it's done right. Lessons learned from our errors prove to be the greatest worth. Troy taught me some innovative, cutting edge, techniques when mounting the turkey. I assure you, you won't find these techniques in any of the instructional videos you may purchase (trust me, I have all the highly recommended turkey mounting videos). What more can I say.... the accommodations are excellent, the training is superb, and the results far surpassed my high expectations. Looking forward to my next visit to the Artistic School of Taxidermy!!!" Just completed a 9 day session with Dennis from Oklahoma. 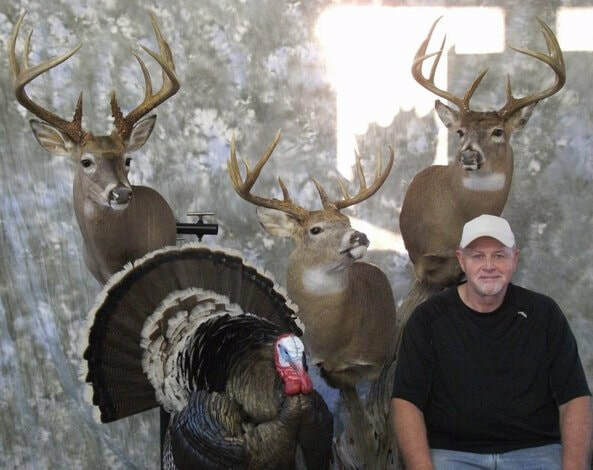 Dennis mounted up two whitetails and a turkey while he was here and he did a fantastic job! We were not able to do finish work on the whitetails, but as you can see, they turned out fantastic. Dennis also learned how to do simple habitat as he made a nice base for his turkey. Dennis you were a pleasure to teach. Great job my friend! "I attended school with Troy the first part of March and it was a Great experience. Troy was a very patient instructor and extremely knowledgeable . The accommodations where outstanding and more than I expected. After learning from Troy I have more than enough confidence to continue to do projects on my own. I would highly recommend Artistry School of Taxidermy to any person wanting to learn the art of taxidermy. It was also the only school I could locate that had a personal touch of one-on-one training. I have plans to attend his school again in the future." Calvin, a Northern friend, ventured South for 18 great days of training. Calvin put in some long hours and completed some great pieces! He did a stunner pedestal whitetail, along with several other deer heads and an elk with detachable antlers. We ran short on time and were not able to get his ducks painted and his elk was still not dry! I know I've said it before, but I can't thank everyone enough for the great quality of students I have the pleasure of teaching. Calvin, you did a fantastic job! Hope to see you again soon my friend. Keep in touch! ey everyone, I just completed 3 days of advanced training with Mark. Mark is an established Taxidermist from Boise who was looking to hone his skills a bit and man did he ever. Mark you did a fantastic job! I can't wait to see pictures of your mounts when you get them all painted! "I was lucky enough to recently be able to match my schedule with a three day opening with Troy for some advanced instruction mainly focusing on anatomy and detail. I have been trying to make this happen for quite some time and I have to say it was as rewarding as I had hoped. Troy's knowledge of the art and techniques never fail to amaze me. Thanks Troy, words can't describe the appreciation I have for your talents and willingness to share them with the rest of the world. I will definitely send photos of the finished pieces after painting." I just finished up ﻿6 ﻿great ﻿days﻿ with Bill. Bill was a student a few years back and returned to do advanced techniques on gameheads and birds. I can't even begin to tell you how much the confidence level increased in Bill after day five! Bill, you did a great job on your blacktail, and , not just on one, but four! His pheasant turned out great also (unfortunately we were not able to get the finish work completed, but we went over everything on a head I was working on in the shop). Bill, it was great having you back. Let me know when you are ready to do life-size. Hope you had a safe trip back. I just completed my second visit (6-days) with Troy and WOW, what an experience. When I first visited Troy, that visit was a Blur, like drinking from a fire hose.. A total information overload. This visit, I was able to focus on some of the finer points and as you can see, the results speak for themselves. For anyone looking for training in taxidermy - LOOK NO FURTHER! What you will learn will be beyond your expectation and leaps and bounds above other schools.. When you are looking at a school, all you have to do is “DO THE MATH” Troy’s tuition includes ALL food (Trust me it is awesome), Beverages, lodging and phenomenal training. You do not need to worry about a hotel, fuel back and forth, rushing to breakfast or dinner and if you need too or you desire to work late, you can. Let's face it, we as Taxidermist often work a normal job from 6 am to 4 or 5 pm them we come home to work another full time job during our peak seasons, so long hours are part of our lives… Taxidermists are always looking for that new way to attract new clients, we spend money for advertising, sporting shows and other things, but we forget to invest in ourselves. The work we produce is by far our best advertisement, so why not invest in honing your skills to produce a better product, if you do not, your competition most likely is. I know it sounds too good to be true. I, like some, were skeptical at first, but Troy is the real deal and goes above and beyond to ensure your experience is great. Do yourself a favor and give Troy a call. you will not regret it. Mark came to learn advanced mounting techniques on turkeys and whitetails for 5 days. I had a great time teaching you Mark. I named are little four legged friend "Buddy" Mark did an awesome job and was even able to get a redhead duck done as well. Way to go Mark!!! "I just finished 5 Great days with Troy and I have to say this was the BEST workshop I could have done. Troy's skills and attention to detail are amazing. He is truly a wonderful teacher, he takes the time to make sure you completely understand each step. I must have asked a million questions and he never lost patience and made the long days in the shop fun. I went there to further my skills and left with a whole new understanding of taxidermy. As far as the accommodations, I have been on many vacations that did not compare. My suite was modern and clean, Troys house/studio are absolutely beautiful with great views and so much wildlife. Turkeys and deer come to feed a few times a day and are only a few feet from the shop door. We saw elk, deer, bear and turkeys all from his yard. Troys cooking skills are second only to his taxidermy skills, he seemed to throw together meals in minutes yet were always delicious and more than I could eat. He opens his house to you as if you were an old friend and I feel I not only got a great education but made a true friend as well. If you are looking to learn or want to advance your skills go see Troy you will not be disappointed! Thanks again Troy." 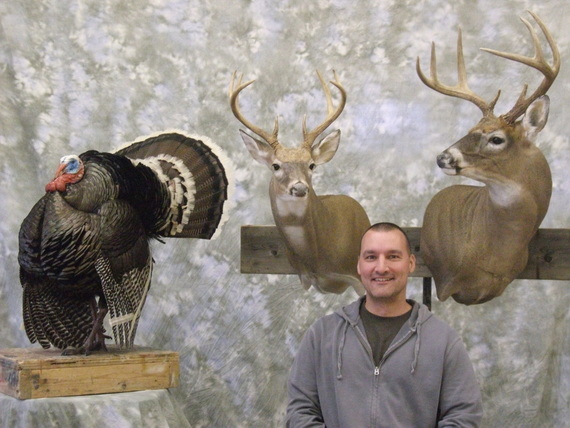 Cory came to learn game heads and turkeys during a 6 day course. 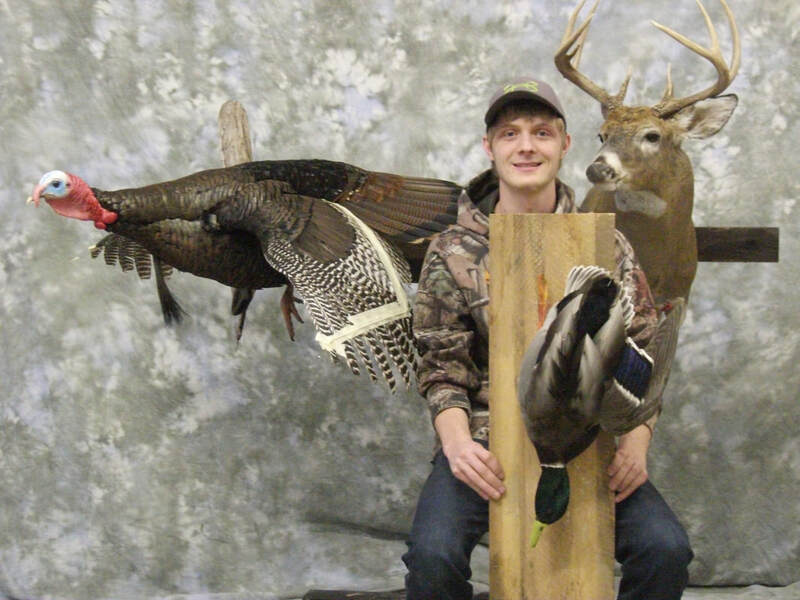 Cory's passion was whitetails, but little did he know he would become a Turkey Bird Man . Cory did an sweet full strut gobbler, a beautiful pedestal whitetail and a shoulder mount whitetail. Cory, you were a pleasure to instruct and an outstanding student! Great JOB!!! 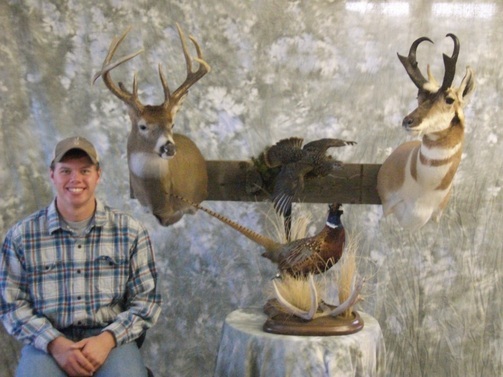 "I just wanted to let some of the folks out there wanting to learn anything, and I mean anything in the art of taxidermy from birds to doing a life-size competition elk - this is the man you need to talk to. I just finished up on a 6 day course with Troy, learning game heads, mounting a strutting turkey, and left with my head spinning. Troy has a way of teaching that makes a person of any ability able to grasp the concept that he is trying to get across. You will truly never meet a man with as much passion for teaching as Troy, he works side by side with you till you have gone as far as you could for the day. While learning taxidermy with Troy take advantage of the TOP NOTCH room and board. The meals were to die for, and your room makes it seem like your on vacation. Almost every morning my wife and I were able to see deer and turkeys coming in right next to our living quarters, what a better way to start the day, well maybe the breakfast was better. 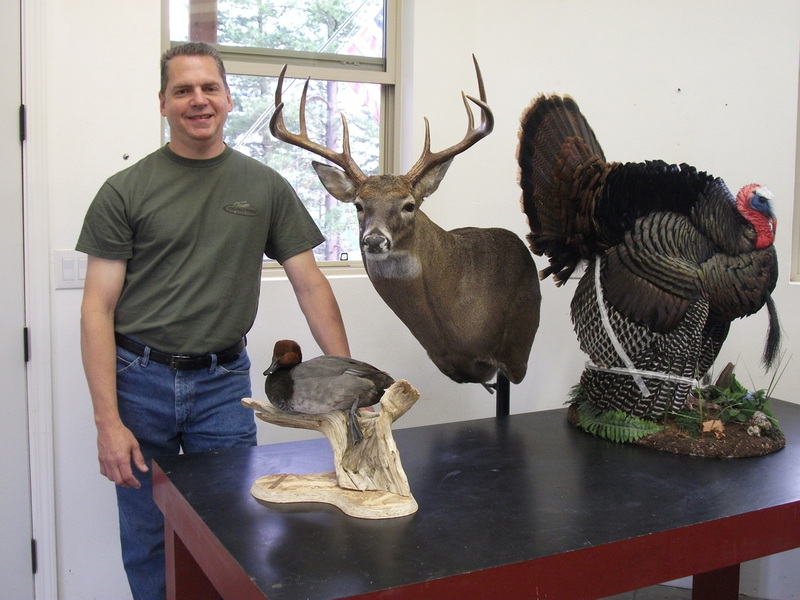 If you have been looking into taxidermy for awhile and you were hesitant, because you though the schooling may be too much, or you feel you may not have the ability to make a go of it - then just give Troy a call. I can guarantee that after that phone call you will walk away saying wow this is the guy to teach me. Talking with Troy, he explained schooling should be affordable for anyone, whether you're a beginner, or have a taxidermy background. Let me tell ya, I drove from Iowa, almost 1700 miles just to learn from Troy, and I would do it again. I learned so much, and my mounts came out so lifelike - it was amazing. Troy will take the time as you mount your piece and explain how the anatomy of the animal will alter hair patterns, ear placement, jaw structure, and etc. It really does come down to more than throwing a cape on and stitching it up. Hey Troy, I can not thank you enough on the knowledge that you gave me and the friendship that was made with my wife and I. I am on a mission now to work on a competition turkey. When I come out again to learn life-size, I'll bring the Cheetos!" I just completed 8 very long days with Derrick who came out from Arkansas to learn Game Heads and Turkeys. Derrick did a fantastic job on his mounts and what a great guy to hang out with. Derrick's pedestal whitetail mount turned out way cool! GREAT JOB DERRICK!!! "Troy, you are the man! Folks, if you are thinking/wondering where to go for beginning or advanced Taxidermy training, I can and will strongly recommend you give Troy a call! I have been out of taxidermy for a few years and wanted to reenter this fascinating field. Through a lot of research, Troy Rose at Artistic School of Taxidermy just kept coming up time and time again. He knows his stuff and is very qualified as an instructor! You will NOT find a better value for your dollar as in addition to the great instruction, you have 1st class accommodations! I will personally guarantee you will not beat the hospitality that Troy extends to his students! Yes we did put in some long hours (this was due to my unparalleled speed) but it was worth every minute. Troy, thank you again! I really needed the "working vacation" and feel as though I have gained a friend! Best of luck in the future with all your endeavors!" I spent 7 long days with Bill on game heads and birds, and all I can say is Nice Work Bill! You were a pleasure to instruct and your dedication speaks volume, way to go Bud!!! 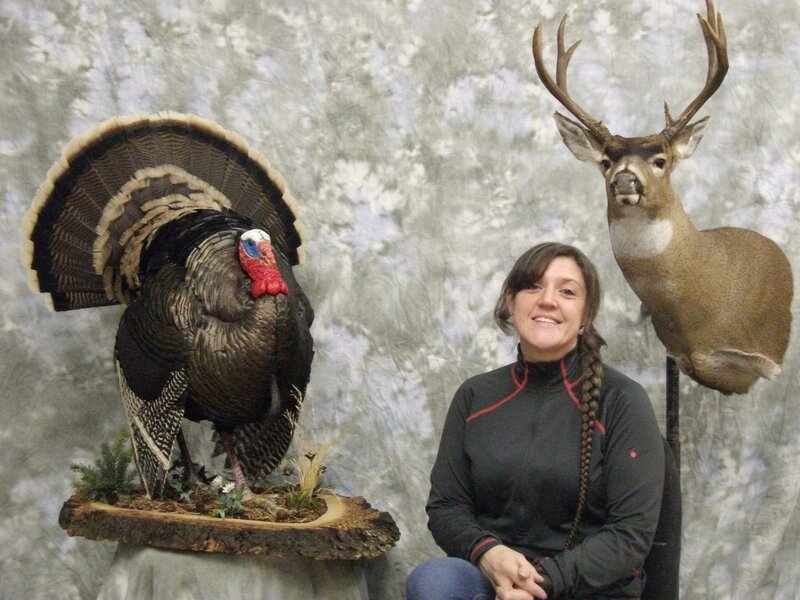 "I am new to taxidermy and wanted to go to a school to learn. I contacted Troy Rose and after a long conversation reserved a 7-day course. When I arrived, it was a beautiful place on top of a hill over looking the rolling mountains of Kooskia, Idaho. The studio was well equipped and the accommodation were awesome!! You will not spend much time in your studio bedroom as I spent from 8am to 8pm and sometimes 10 pm in the studio. be prepared to gain a few pounds as the food was great!!! The room and board is included!! When you wake up in the mornings you can see elk, deer, and bear from the kitchen and receive visits throughout the day from the resident pheasants. During my seven day class I mounted a Blacktail, Antelope, Golden Eye and a merganser. These classes are all hands on, bring a note book and a camera because I probably forgot more than I remembered. Troy can accommodate the beginner to the advanced student and African classes. After my class Troy has always been there to answer any question and give me guidance and critique my work, which is invaluable."